Andrew wrote: That's a nifty workaround! 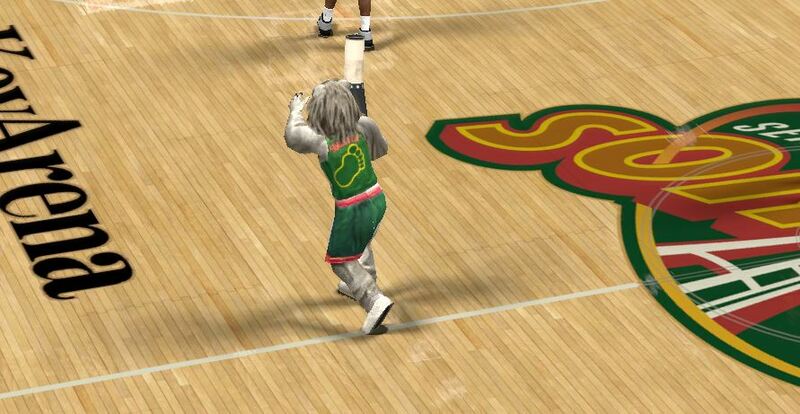 Yeah, hopefully can find a way to get Coyote mascot in the game as well, not sure why 2k did not include him, he has been around for awhile. That's looking better. Maybe needs to be slightly darker with some grey streaks, but again, I love the creativity of the idea. Andrew wrote: That's looking better. Maybe needs to be slightly darker with some grey streaks, but again, I love the creativity of the idea. Good point, will work on that. DENVER - "We're on the right track, it's a big win against a team like Seattle" Rose said after scoring 17 points and dishing 9 assists. Nuggets have won 3 straight and improved 3-1 after a loss from Lakers on opening night. Nuggets won close games, 1 point lead against Spurs and Warriors where Nuggets needed an overtime. "He's (Rose) shooting the ball with confidence. When you have players like him, the game gets really easy for him and for everybody else." Coach Bickerstaff said. 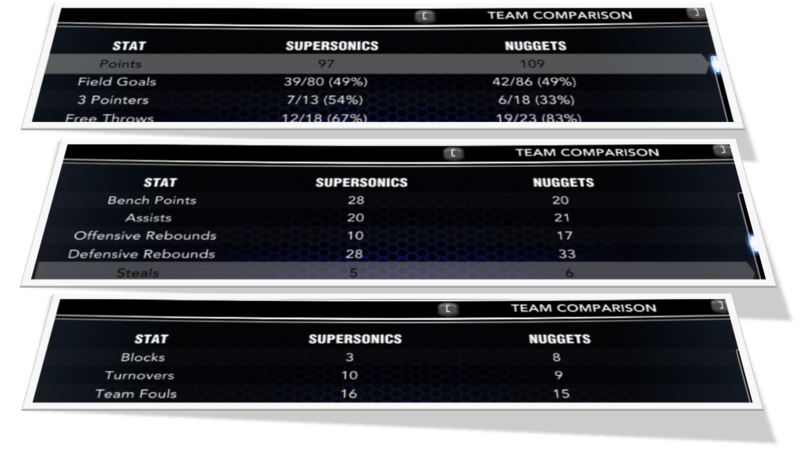 It was close for 3 quarters but Nuggets found the right defense to shutdown the Sonics in the 4th, outscoring the Seattle 33-19. The Nuggets made a 11-2 run with 4:01 remaining in the 4th, 98-95. 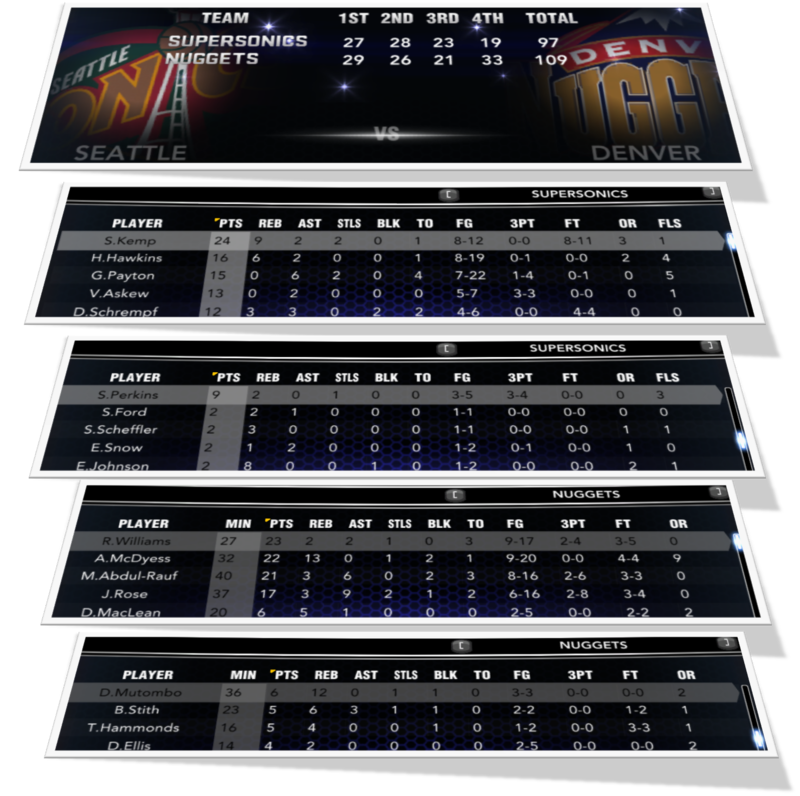 3 Nuggets players scored 20+ points lead by Reggie Williams 23 points, Antonio McDyess 22 points and 13 rebounds and Abdul-Rauf 21 points. 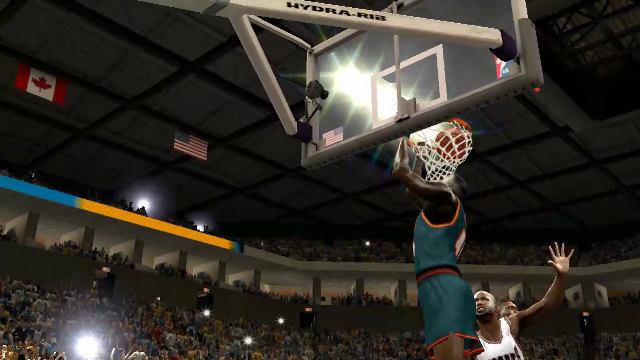 Shawn Kemp led the Sonics with 24 points and 9 rebounds. Last edited by truefaith0826 on Thu Feb 14, 2019 8:39 am, edited 1 time in total. Rockets led the most part of the game. Heat was able to tie the game at 78-all with 10:12 remaining in the 4th thru Willis' free throw show and grab the lead 81-80 when Bimbo Coles made a 3-point shot 8:41 remaining. Rockets' defense is all over after that, Kenny Smith even blocks Mourning's shot in the post and made 2 clutch 3-points with shot clock winding down. "We will make it hard for him whoever is guarding him" Kenny Smith said. Alonzo still had a monster game with 17 points and 18 rebounds. Kevin Willis was the top scorer with 22 points. "We let other factors affect us," Willis said. "We let them take control of the game. They have the lead and were still playing poor defense." Rockets will travel next to Minnesota who had an escaped win against Lakers while Heat will host undefeated New Jersey. Last edited by truefaith0826 on Mon Mar 04, 2019 5:42 pm, edited 5 times in total. Great to see another update! 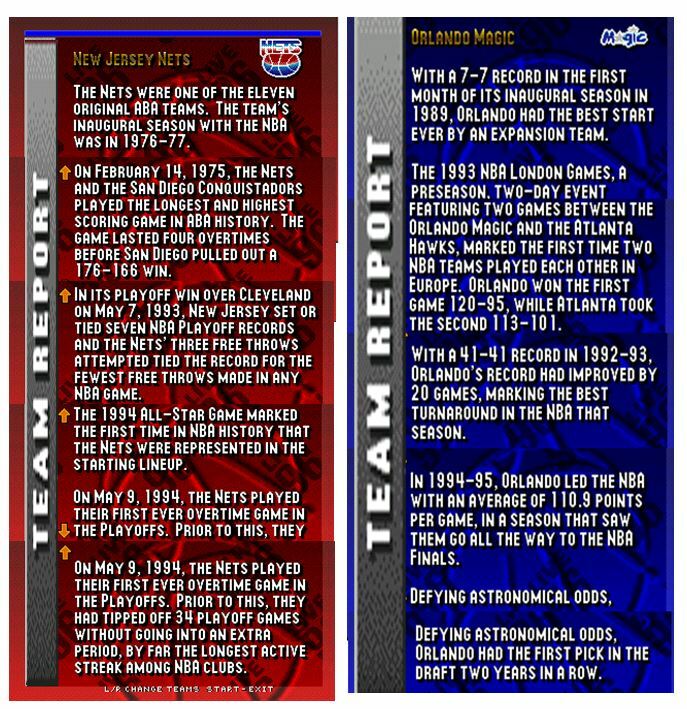 FLORIDA - Even with Shaq and , both teams Magic and Nets have been doing a great defeating their opponents. Led by guard Kenny Anderson, the team's floor general and leading scorer, has been averaging 18.0 pts 10.3 asts in their 1st three games. New Jersey City's All-Star point guard scored 15 points and dished 12 assists in the game, and the Nets was able to win after wasting 16-point lead to keep the winning streak to three with a 104-99 victory over the Orlando Magic. The Nets needed every bit of it -- forward Derrick Coleman still out due to a sore right knee. It was close from the start with no team not leading by more than 4 points and 5 lead changes. Bench players made Jayson Williams grabbing 7 boards in the less than 6 minutes and has two followup dunks and wingman Donald Royal always ready when Magic has a fastbreak. Nets leads by 1 at end of first 23-22. Nets started strong in the 2nd and put a 29-22 and was able to stretch it 54-41 end of 2nd quarter led by Kenny Anderson's 5 assists and rookie Ed O'Bannon's perimeter shooting. 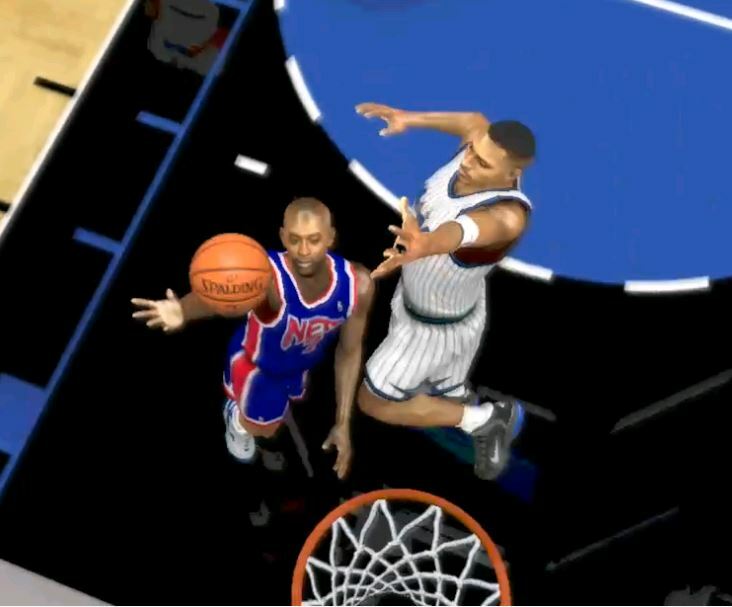 The game looks like Nets is about to have a blow as they build a 16-point lead in the 3rd 61-45 9:30 remaining but Magic found a way rally led by Penny and Horace Grant. Magic was able to grab the lead again 87-86 after Penny made a 3-point shot and had a chance to put away the Nets with 94-90 lead but just kept on missing shots until Nets was able to tie the game 94-all with 2:25 remaining in the 4th. 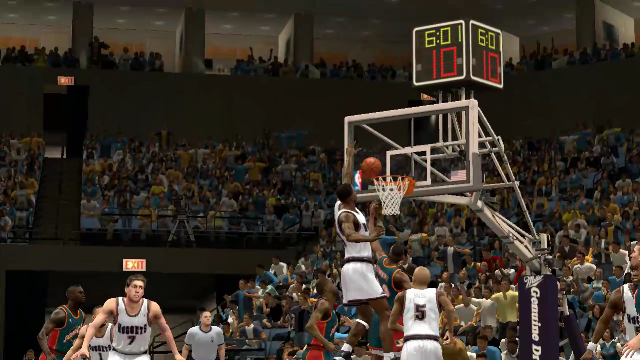 (Watch the video to see how Nets won the game). "One of the things we talked about that I said before the game tonight is that we have to defend at a higher level every single night. " Nets coach Butch Beard said. "Offensively, we struggled to get any kind of flow or continuity there, but I give our guys credit -- they still tried to work as hard as they could to defend, even though offensively, we had our challenges." "With Coleman out, certainly offensively, it's been a challenge the last several games, we are missing his 20 points per game " Anderson said. "I've been trying to find a way to keep helping our guys offensively in order to create an identity with him being out." New Jersey next road game is against Miami Heat who just lost against Houston Rockets while Orlando Magic will visit Boston Celtics. 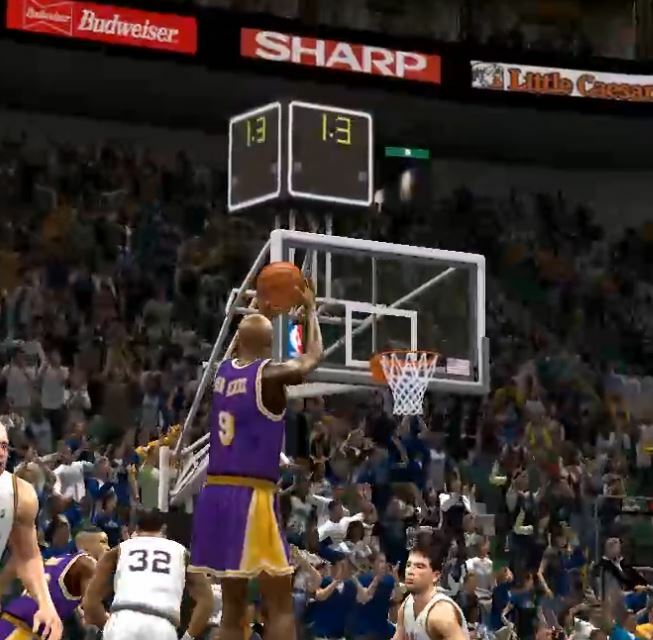 Lakers enters the game coming from 1 point loss against the Timberwolves, only this time Nick Van Exel made sure there's no dejavu as he sunk the game winner with 0.3 seconds left, Van Exel finished the game with 29 points, 8 assists and 3 steals. "We needed this, it's back to back game for us and we came out winning against a tougher team and redeem ourselves." Van Exel said. "We know who to tap in times like this, I know his ball handling and quickness will work against Stockton that's why we isolated him" coach Del Harris said. The score was 86-80 favoring Utah with 4:14 left in the 4th but Lakers made an 8-0 run led by Van Exel and Campbell to have the lead 88-86. Chris Morris was fouled by Ceballos and made the 2 free throws. With 36.4 seconds left, Vlade Divac made a layup against Greg Ostertag in the post. 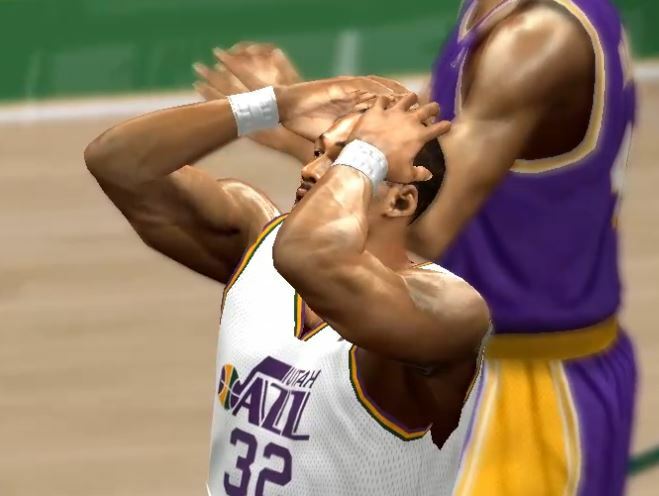 Karl Malone answered with a fade away jumpshot against Blount with 24.9 seconds. Malone made his first 11 shots and finished with 24 points and 11 rebounds while Stockton struggled shooting 2-11 only and dishing 7 assists. 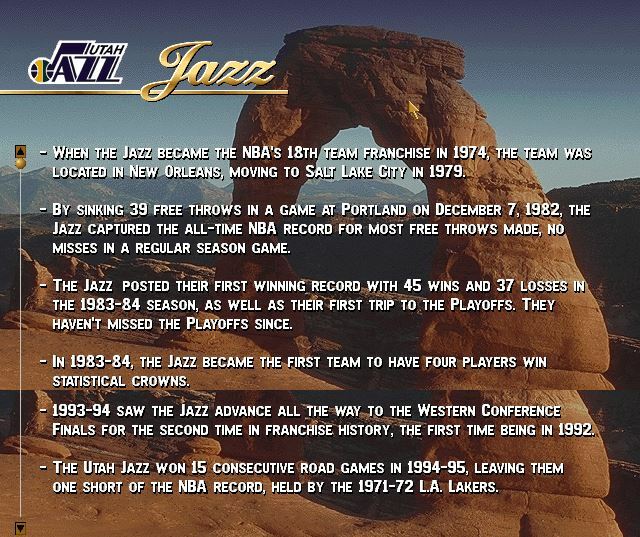 On their next game, Utah will host next Denver Nuggets while Lakers will visit Seattle Supersonics. Last edited by truefaith0826 on Thu Apr 04, 2019 11:55 pm, edited 2 times in total. 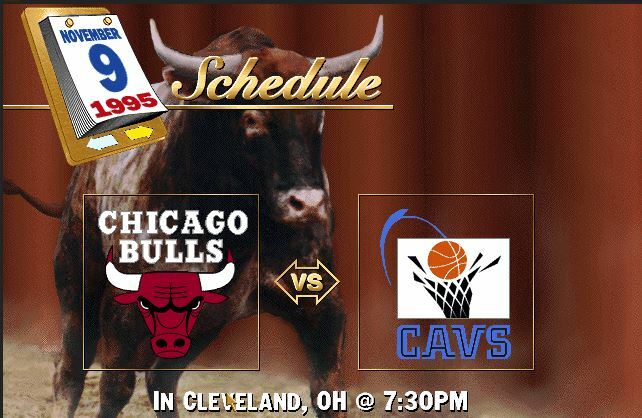 Will the winless Cavs (0-3) put an upset against streaking Bulls (3-0)? Last edited by truefaith0826 on Thu Apr 04, 2019 8:27 pm, edited 1 time in total. A clash of rivals up next...though, the Cavs weren't exactly at their strongest that season. 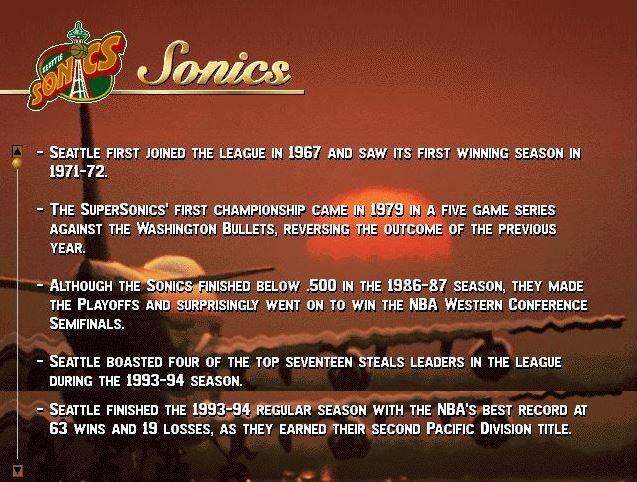 The 1995–96 NBA season was the season where 2 expansion teams were added in the North. 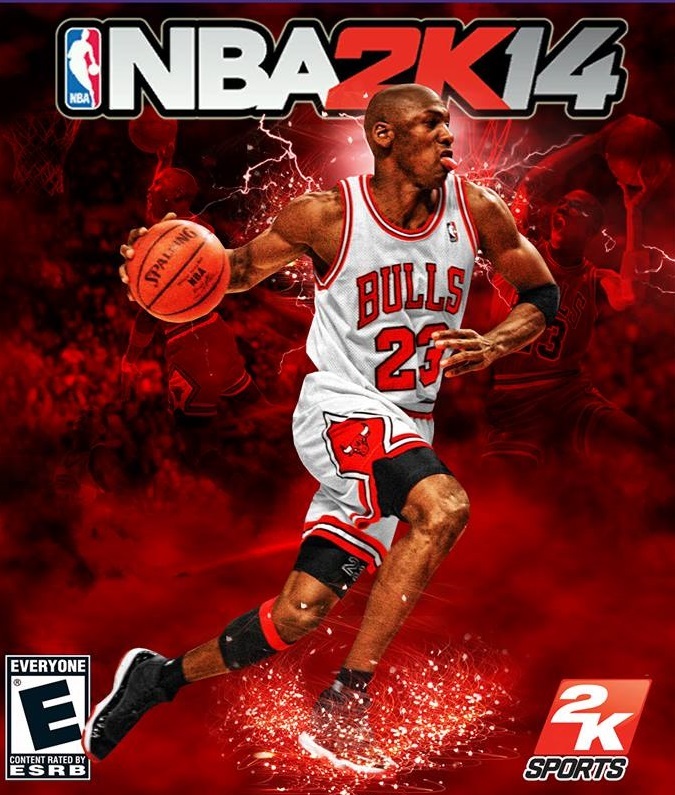 Rusty MJ came back in the previous season but came up short against the Magic during the playoffs. The Bulls have added Rodman hoping he will provide the muscle they are looking for at the middle. Hornets coach Allan Bristow told Larry Johnson to keep on attacking the post. When asked his reaction, LJ said "that's what I want to hear." 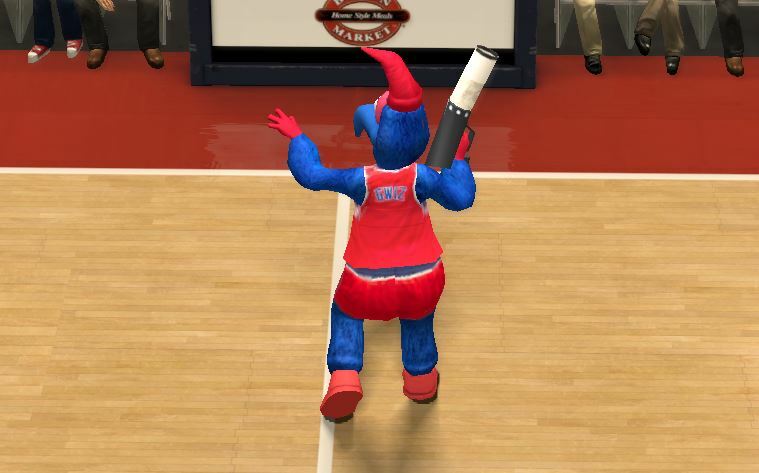 Johnson had 33 points, and Charlotte beat the Washington Bullets 112-101 on Wednesday night for their 3rd straight victory of the season. 2.7 apg. "I hope I stay healthy this season just like last year." 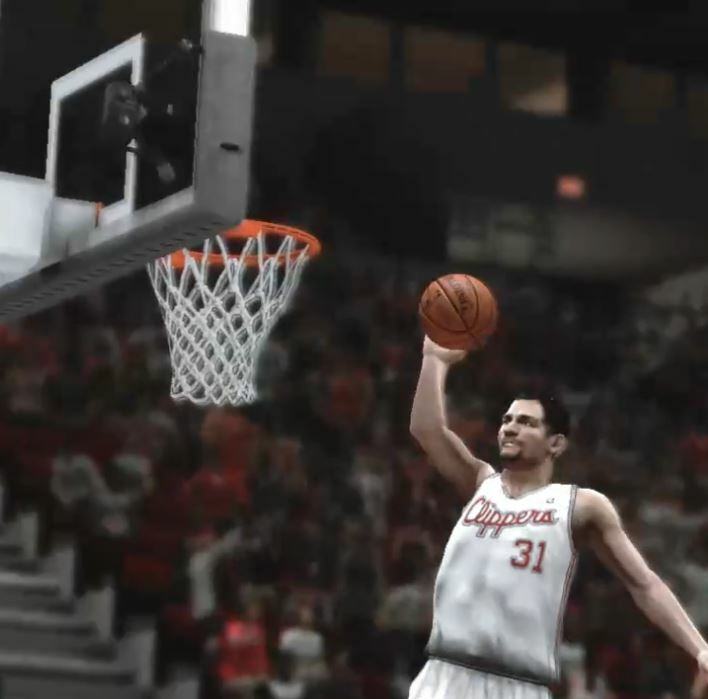 LJ added. "We trust his post game, his moves are unbelievable, when you are 6'7" and you are dunking on a 7'7s and 6'10s, he is special " Reeves said who had a double-double with 17 points and 11 assists. "The confidence, the spacing around him, the movement around him, with Glen Rice above the 3-point line, expect those defenders to keep him in area." 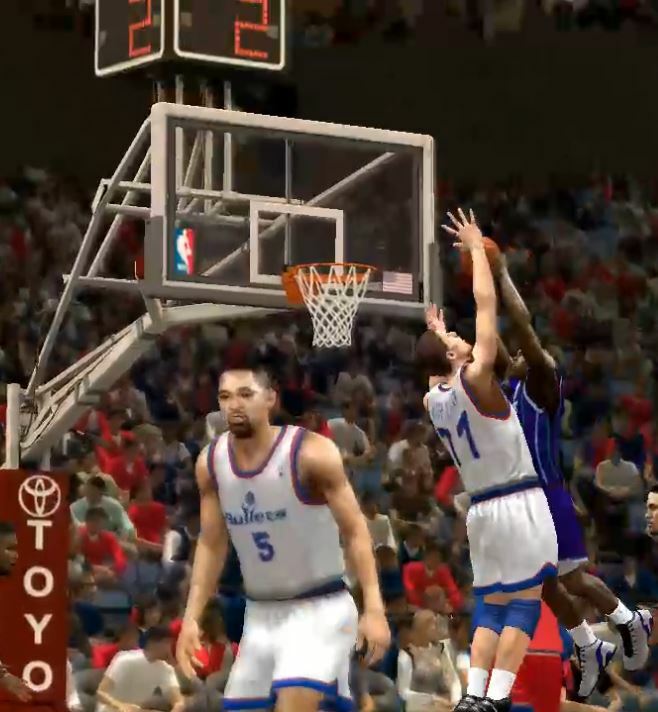 Though Glen Rice scored only 8 points on 4-10 shooting, the Hornets still led each quarter. 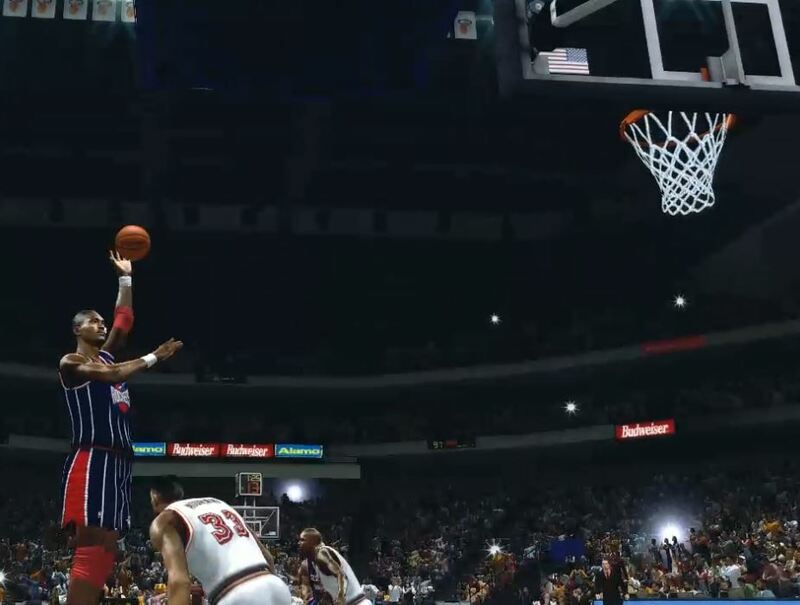 Rookie Rasheed Wallace led Bullets with 21 points. Washington still misses the services of Chris Webber due to dislocated shoulder. Last edited by truefaith0826 on Sun Apr 14, 2019 4:46 am, edited 1 time in total. 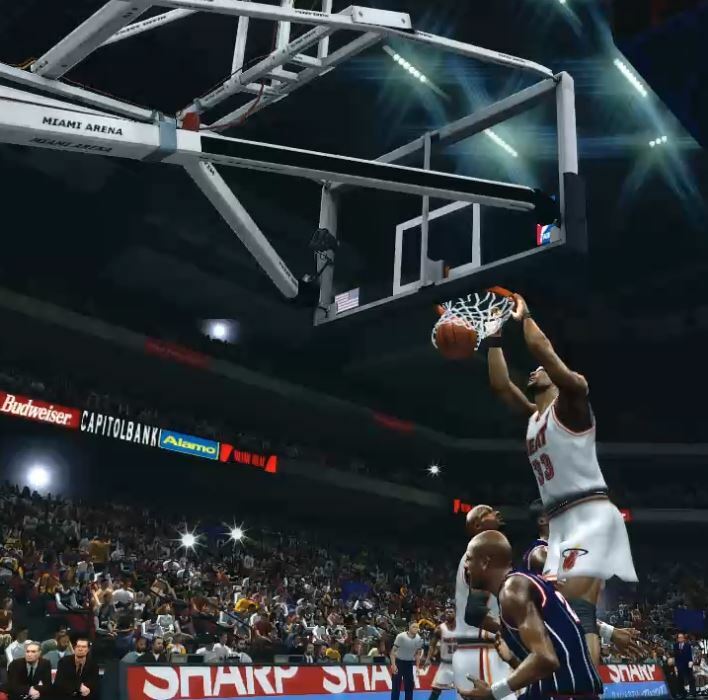 Fearlessly attacking the 7'7" monster there! Michael Jordan scored season high with 51 points and Pippen added 20 points to help Bulls to a 114-99 victory over the struggling Cleveland Cavaliers on Thursday night. "It's nice to get my rhythm," Jordan said. "We are on a roll and and we like that." 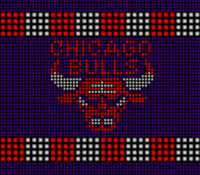 The Bulls, who had won the last 4 games this season and in 1st place in the Eastern Conference. 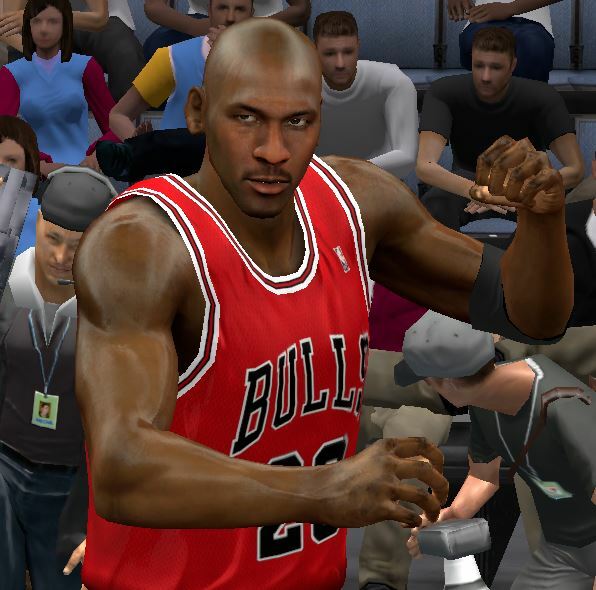 Bulls was up by 18 at the end of 1st quarter with Jordan scoring 16 points. "They started hot and ended good defense" Coach Phil Jackson said referring to the 11-0 run beginning of 1st and ending it with 35-17. 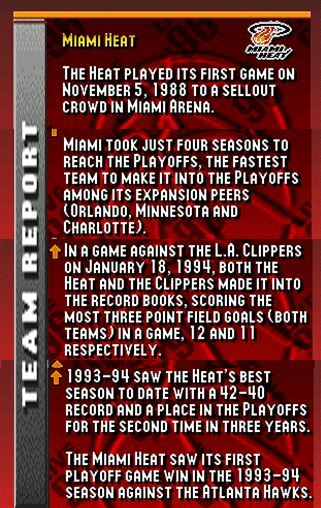 Dan Majerle and Bob Sura led the Cavs in 2nd to outscore the Bulls 33-27. "When we're like that we're going to score a bunch of points and if our defense can keep improving then we're the team that we want to be," coach Phil Jackson added. Chris Mills had 18 points for the Cavs and Terrell Brandon with 12 points and 6 assists., who have lost four straight. "We knew they were very capable and tonight they did. It was tough match ups trying to stop those guys." Cavs coach Mike Fratello said. Cavs open the 4th quarter with 11-4 run and got close within 1 with 7:41 remaining. "Jordan made me pass and limit my shots", Bobby Phills said who had the chance to give the Cavs the lead when he missed a jumper in the side. Bulls have a 2-point lead 99-97 with 4:11 remaining when Bulls shut the Cavs down to end the game with 17-2 run. Last edited by truefaith0826 on Tue Apr 23, 2019 5:28 am, edited 1 time in total.